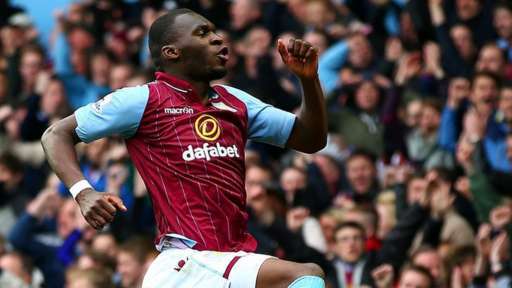 Christian Benteke scores twice for Aston Villa in Premier League Fixtures. At Anfield, Steven Gerrard scored an 87th minute winner for Liverpool to beat QPR 2-1 and keep their chances of finishing the top four this season alive. Gerrard, who received a standing ovation at Anfield when he left the field, had earlier missed a 79th minute penalty kick and the captain was delighted to have grabbed the resulting winner three-minutes from time. “I would have put my mortgage on Steven Gerrard scoring a penalty but you know the miss will have inspired him more and he got the header and has made a career of big goals like that,” Liverpool manager Brendan Rodgers said. “He is a truly remarkable player and he deserved the ovation. Christian Benteke scored a first half brace and Tom Cleverley added another goal in the second to help Aston Villa hold on for a 3-2 victory against Everton to move up to 14th in the EPL standings. Aston Villa manager Tim Sherwood, although showing delight with the goalscorers’ performances, picked out his captain Fabian Delph to put in the spotlight. “I don’t want to go over the top but – Fabian Delph – there’s not a better midfielder in the country at the moment,” Sherwood said. “He breaks the play up, he carries the ball well and he can pass it. He’s got everything to his game and he can score. It was a wonderful day as well for Leicester City, who cruised to a 3-0 victory over a confident-low Newcastle United side that suffered its eighth Premier League defeat in a row and their 18th overall on the season. At the same time, Leicester City were picking up their fifth Premier League win in six games. Newcastle United boss John Carver felt let down by the performance of his players, especially the two players who received their marching orders after committing two silly fouls. “On a scale of one to 10, it’s a minus 10. I can’t accept it,” said Carver watching his side restricted to nine-players and went down without a fight. “I wish the players had as much determination and fight as I had. Two successfully converted penalties by Jordi Gomez carried Sunderland to stunning 2-1 win over 10-man Southampton, who had James Ward-Prowse sent off in the 54th minute. It wasn’t the result Southampton boss Ronald Koeman was looking for. “We didn’t play at our level and it is very strange,” Koeman said. “We played much better with 10 players than with 11 and it was unbelievable that we were not able to play as well. “There was a period just before half-time that was the worst 10 minutes of the season. There were also wins on the day for Swansea City, who beat Stoke City 2-0, with Marc Wilson picking up a red card for the traveling party in the defeat, and for West Ham, who picked up a 1-0 win over Burnley, who were also reduced to 10-man, following the sending off of Michael Duff in the 23rd minute.